Hola peeps! Happy Friday to you all! I am so happy that the weekend is near as it has been pretty hectic for me as of late. Also with the change of weather I have been slowing it down a bit however that doesn’t stop Friday’s Sass–Luxe Chic. Since the cooler temps are starting to creep in that means that it is all out sweater weather and when paired with luxe fabrics like leather and suede makes all the more tolerable. Don’t you agree? Take a peek at this ensemble and let me know your thoughts. I definitely would rock this look at work, to a dinner date and out on the town! Don’t forget to dress warm and fashionable this weekend…enjoy! Hola! We’re at the mid-point of NYFW and here we are on Day 4. It’s Sunday, partly sunny and breezy….today is a day when I just want to be comfy but fashionable. This look is perfect for running around shows and brunching in between with fellow fashionistas. Take a peek and let me know what you think! Also stay tuned to my instagram (@sassncurlz) page for up to the moment updates on shows. Later chicas! Hola! Happy Friday! Today’s sass Laid-Back Glam is exactly what I am feeling right now. The holidays are over but my urge to wear something with high shine (like this metallic skirt) is still here. However I do want to be comfy and warm so when paired with this thick H&M sweater—I get a little bit of both within this ‘fit. At first glance it may seem to clash but I think that the two compliment each other; similar color undertones, patent bow pumps and a bright red lippy says here I am! So what do you think of today’s sass? Would you wear or wouldn’t dare? Do tell! Hola peeps! Today I’m digging the much-anticipated collaboration between Isabel Marant and H&M. It officially drops tomorrow Nov. 14th although they did have a special press shopping day yesterday (no I didn’t get an invite womp!). If you plan to hit up the store be prepared to wait in line and brave the crowds because I am sure that it will be insanity! However if you can’t tolerate that (I can’t) charge up your laptop, iPad or smartphone and shop online starting at 12 pm. To get you started I created this set with some key pieces from the collection which I am sure to go quick. Happy Shopping! Hola peeps! Are you a Pinterest head? Do you peruse the site and get lost for hours pinning things that you want to fill your closet, home and refrigerator with? Well I’m addicted and have no intention of seeking help haha. I have been pinning a ton of fall looks on my boards but this one instantly caught my eye. Peep this chica’s fab style (sorry I don’t know the source of the image, if you do please share)! I am in complete love with this look, so much so that I was inspired to create this set—Fall Fête. 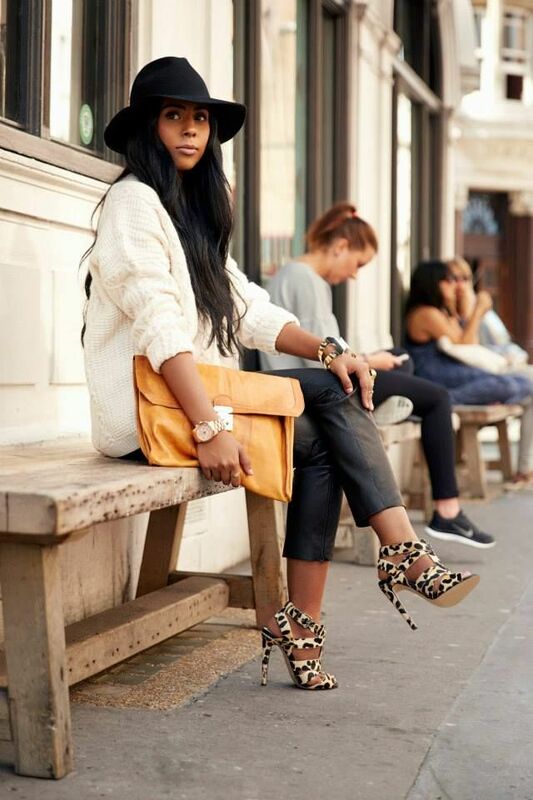 You can’t go wrong with a chunky jumper, black skinnies, gold accessories and pop of leopard print. Don’t you agree? Take a peek and let me know what you think! Oh while you’re at it be sure to follow me here on pinterest for more great ideas. Happy pinning!